Pair Bonding, built completely from my paternal grandmother’s late 1930’s wedding china, has its roots in a contemplation of how the institution of marriage – human pair bonding – has evolved in the generations between her marriage (1937) and mine (1984) and beyond. The changes have been significant: today we’re free to marry whomever we wish at whatever age/status we wish – or not marry at all – without (for the most part) risking ostracism, being fired from a job, or being thought defective. But what hasn’t seemed to change is our tendency to choose partners (whether we marry them or not) who are different from us, whose metaphorical knees and elbows hit us at odd places and require adjustment, attuning, a learned alignment. 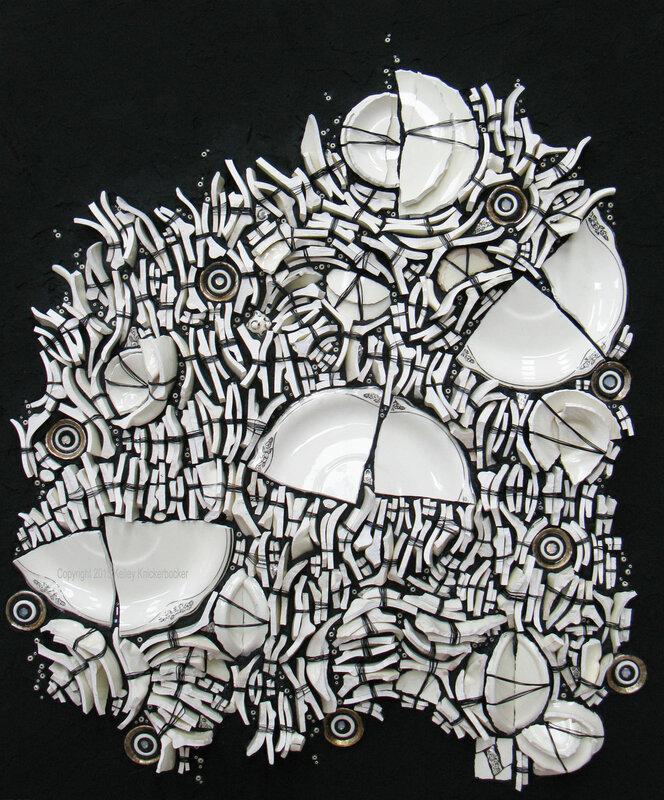 All the pieces in this mosaic are paired and bound together with wire. In selecting the pairs, I looked for pieces that didn’t spoon together identically. It would have been much easier and less time consuming if each pair hadn’t required accommodation of one anothers’ “knees and elbows,” but perfect fits probably wouldn’t exhibit the hard-won grace that each of these unique pairs do. One of the things I love about using space as a framing device around mosaic is that it allows each line to meander out to an organic end. Don’t get me wrong, the constraint of a hard boundary can have lovely creative implications, but for the moment I’m reveling in the frayed edges of the wide open. My latest series, Four Bars, made solely of recycled glass from our local Bedrock Industries, is on view at the Bounty coffeehouse/bar at 45th & Stone Way N in Seattle through 4/30. Sip, savor, see. To adult or to art. Daily decisions. As a one-woman shop, my To-Do list is always longer than my day. I'm a multitasking machine, and triage is often my resting state. Yesterday was no exception, but I gave in to the temptation to park the yapping world outside the studio door, pick up my most recently acquired materials (blown glass salvage from Bedrock Industries! ), and with no particular plan in mind make them quickly do something interesting. I find this sort of exercise both freeing and challenging; it's refreshing but also sharpening my intuition, perception, skill. My Sudoku, as it were. Gorgeous one-minute teaser vid for The Mosaic Experience, Auray, FR, 21 Apr - 20 May 2018. After 12 years, a facelift. Smoother, tighter, no stitches at the hairline. Thank you Shannon Spires for pointing me to Squarespace and getting me started, and thank you whizbang millenials at Squarespace who've simplified the tech enough that a techtard like me can design an attractive, functional, maintainable website start to finish and still have all my hair and fingernails intact. Not even any eyeroll whiplash! My colleagues and friends in the Northwest Mosaic Arts Alliance are at it again. Come join us this Saturday 4-7pm for the opening, or come on by during the run to see this diverse yet cohesive exhibition.